The most popular and astounding area of the world&apos;s biggest ice and snow festival is called the Grand World of Ice and Snow. The annual ice sculpture competition/display grew from almost nothing in 1999 to become the world&apos;s biggest. Amazing ice cities bloom up at the start of winter and melt in February or March. Tallest edifices: The tallest ice sculptures reach about 46 meters high. 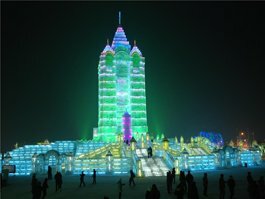 The huge ice city made the annual Harbin International Ice and Snow Festival famous around the world. The tens of meters high ice creations are very colorful at night at the Grand World of Ice and Snow area. Computer controlled lightning adds a high tech dimension to the skillfully and artistically crafted masterpieces. The dazzling colors and light effects along with lots of amusements such as slides and an ice maze are meant to make the festival the most entertaining in the world. Visitors walk around in the lanes between the edifices as if they are walking through a small town (0.6 km2 , ¼ sq mi., or 25 city blocks). The sculptures are so big, they even walk on them or into them. The buildings, towers, and sculptures are meant to look realistic. Many are ice work recreations of real buildings or things around the world. For example, in 2014, the highlight was a replica of the Hallgrimskirkja church in Reykjavik, Iceland. It stood 46 meters tall, and it was made of 12,000 cubic meters of ice. It had a 240-meter-long slide for visitors to zoom down. 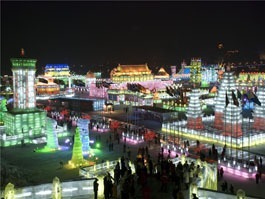 The first ice festival were built on the bank of the Songhua River at the end of 1999. It is one of the three display venues of the well-known Harbin International Ice Festival. 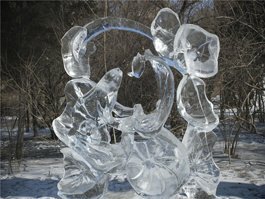 It has kept growing bigger so that now it gathers teams of elite ice sculptors from around the world who make the world&apos;s finest and biggest such artworks. Dates: December 21 to February. 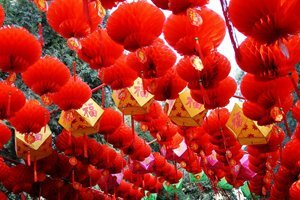 Tickets: 9:00 – 12:00: RMB 150 per adult; 12:00 – 9:00 pm: RMB 330 per adult on New Year’s Day, Spring Festival and Lantern Festival and RMB 300 per adult on other days. How to get there: There is a special tourist line to get there. The bus departs at the Youyi Road Station between 9:00 am and 10:00 pm. Bus 88 or 118 go there. If you visit, you&apos;ll see the massive ice sculptures don&apos;t stand alone. On adjacent Sun Island in the Songhua River, there are the world&apos;s biggest snow sculptures you can see by day. They are made of snow instead of ice. Zhaolin Park across the Songhua River features smaller intricately carved ice lanterns that are lit up at night too. Sun Island for white giant snow sculptures that are made of snow instead of blocks of ice. Zhaolin Park for ice lantern displays. 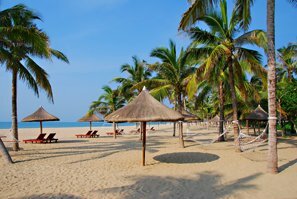 Our tours can be customized to your interests and requirements. 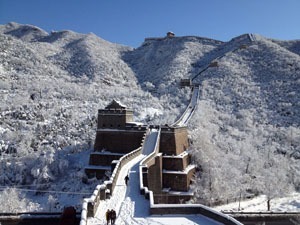 You can contact us directly for a tailor-made Harbin/China tour.